Welcome to the website of the 1st Ranger Battalion, a tactical realism unit for Arma 3 and Post Scriptum. We keep gaming fun, and well-organized. Interested in enlisting? Learn more about us and fill out an application. Everyone please join me in saying Happy Birthday to the 1st RB and congratulating everyone on our 7th year of active service across multiple games. The 1st RB was originally established on 09JUL11 and has seen many different forms, commanders, and members over the years. The 1st RB you see today is due to the many hours of work those still here and those that came before us put into this wonderful community. It truly is remarkable that such a large group of strangers with differing opinions and view points have been able to come together for so long for a hobby they enjoy. 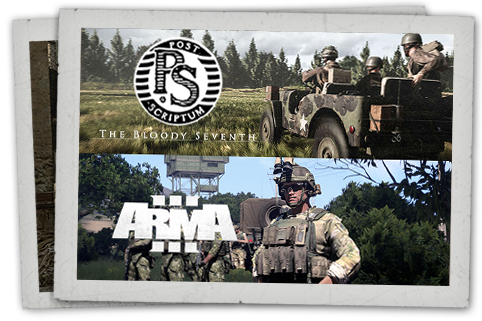 The 1st RB is now focused in ARMA3 and looking to expand to future titles such as Post Scriptum and Hell Let Loose in the fall. Our public discord is accessible via an invite, so let one of us know if you would like to join us for some tactical comms or just good times and laughs. We're always looking for more folks to hang around the discord and join us for some games - be it ARMA, RO2, PubG, etc there's always someone to game with! Today is a very special day for the First Ranger Battalion! On this day back in 2011, the 1st RB was officially activated. We've come a long way since then and seen so many faces pass through. Like any organized group, we've had our ups and downs but we've always prevailed and have come back stronger. We continue to be one of the marque units in Day of Infamy having a very steady community player involvement on all of our servers. Just recently, we won our first official engagement against the 502nd PIR. It was a hard fought battle and the 502nd put up a tough fight but we were able to prevail. I'm excited to see more matches in future against the 502nd and others. On a more personal note, Major Bos and Technical Sergeant Kruijthoff will both be heading to reserves. Both of them have contributed copious amounts of time to the 1st RB and we thank them for their service. As a result, Griffin has been promoted to Major and will be the new Executive Officer of the Battalion and running the Company in his stead is Captain Rifle and First Lieutenant Johnson. Signing off from the Commanding Officer's Desk.